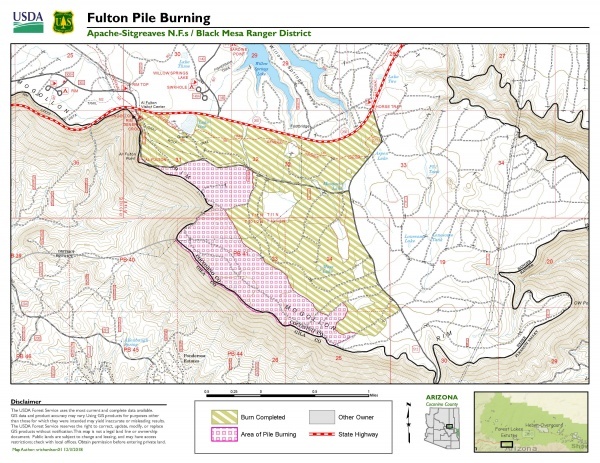 The Black Mesa Ranger District on the Apache-Sitgreaves National Forests plans to conduct a prescribed burn within the Fulton Timber Sale area to the south of Highway 260, West of Forest Road 512, and North of Forest Road 912E. The burn area is located within Township 11N, Range 14 East, and Sections 32 and 33, and Township 10.5N, Range 14E, Sections 23 and 24. Half of this project area (663 acres) was completed in October of this year. About 500 acres still remain and the district plans to burn on December 4, 2018. The intent is to burn remaining slash piles created from logging operations. Ignition depends on the weather. Smoke will be seen from Highways 260, the Young Highway (Forest Road 512), and from the community of Forest Lakes. Smoke may also be visible from the Colcord and Ponderosa Estates area below the Mogollon Rim. There may be light to moderate impacts within the area throughout the remainder of the week and should decrease significantly each evening after the primary ignition occurs. Once ignition occurs, crews will be on scene from ignition until there is no longer a threat of escape from the project boundaries.